The practice of marking the final resting place of a loved one goes back thousands of years. The ancient pyramids are conceivably the greatest example, standing today as a reminder of the ancient Egyptian glorification of life after death. Roman catacombs, a subterranean burial place for early Christians, contained niches where the fully clothed bodies were placed and which were then sealed with a slab inscribed with the name of the deceased, date of death and a religious symbol. Many of the elaborate grave markers erected in the 19th and early 20th centuries were styled after the memorials of the ancient Greek, Roman and Egyptian civilizations. Following the first World War, grave markers started to become smaller and less elaborate - plain crosses and simple, upright stone slabs decorated with carvings, symbols and epitaphs. Cemeteries are living lessons in history. People who buried their dead said much about themselves and the ones who had died. While not considered a primary information source, gravestones are an excellent source of dates, birthplaces, maiden names, spouses' names and parents' names. They can also provide evidence of military service, membership in a fraternal organization and religious affiliations. Why should you visit the cemetery if you already have a birth and death date for your ancestor? Because you never know what you may find. Nearby gravestones can lead you to other family members. Little grave markers can tell the story of children who died in infancy for whom no other records exist. Flowers left on a grave may lead you to living descendants. Other than a few records and documents and, perhaps, some family jewelry or heirlooms, your ancestor's tombstone is the only physical evidence of the life they lived. There is nothing in your genealogical research that will connect you to your ancestor more than to stand in the one place on earth which contains their mortal remains and to see important pieces of their life carved into stone. It is an amazing, awe-inspiring experience. The first step in cemetery research is the obvious one—to learn where your ancestor is buried. Death records will often contain this information, as will obituaries. Published cemetery surveys may list your ancestors. Check with family members and other relatives as well. They will often know of family burial locations or may be able to track down a mention on a mass or prayer card or in the family Bible. Funeral homes and morticians can be great allies in helping you to locate cemetery records. Funeral home records may still exist which can contain a wealth of information, including the burial location. Funeral directors will have knowledge of most cemeteries in their area, and may also be able to point you to family members. If a funeral home is no longer in business, then check with other area funeral homes as they may know where the old records are located. If you know your ancestor's religious affiliation you may want to try contacting the church in the area where your ancestor lived. Churches often maintain attached cemeteries and also keep records for their members who are buried elsewhere. The local genealogical or family history society is a good source for information on local cemeteries. These groups are continually working to preserve valuable cemetery information and may have compiled cemetery indexes or be able to provide clues to little known burial locations, especially family cemeteries. Old local histories can also prove useful in identifying former names and locations for cemeteries which have been moved. The Internet is fast becoming a valuable source for cemetery records as well. Many cemetery sites such as FindAGrave and BillionGraves, have online cemetery records, photos, or transcriptions, or use your favorite search engine to search for a specific cemetery. 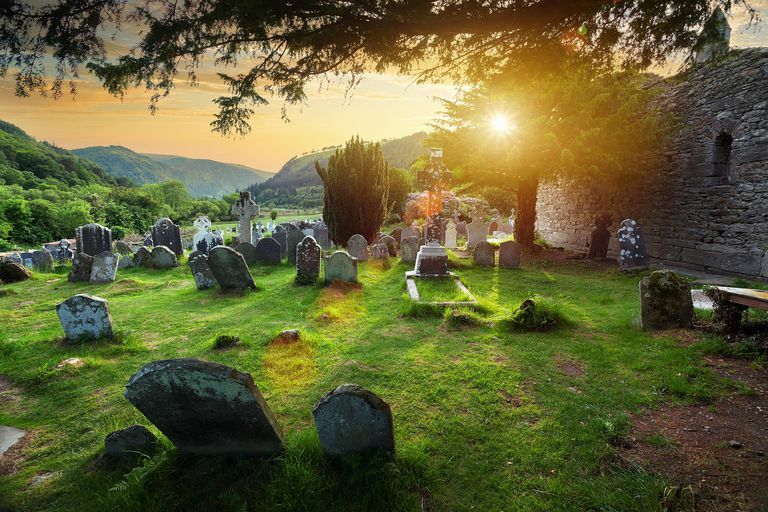 Special geographic place name search engines can also help to locate a cemetery, though the information available on the Internet varies widely by country. The U.S. Geographic Names Information Server, for example, allows you to narrow down your search by selecting cemetery as the feature type. If you have narrowed down the area, but aren't sure which cemetery may contain your ancestor, then maps, especially historical maps, can be of great assistance. Use land, tax or census records to help you pinpoint your ancestor's land on a map. You will often find them buried in a nearby cemetery, or even in a family cemetery on their own property. Topographic maps or locality maps may show cemeteries, roads, houses and farms. Even little details such as elevation features can be useful as cemeteries were often erected on high ground. When heading out to the cemetery for some tombstone research, a little advance planning can really help to make your visit a success. The best time to visit a cemetery is in the spring or fall - especially if it is one which is neglected and overgrown. Brush and grass will not be as high in the spring, which will help you to discern holes, rocks, snakes and other obstacles before you trip over them. Sometimes the season can have an impact on whether you even find the cemetery at all. I have located several family cemeteries in the southeastern U.S. which are situated in the middle of cornfields. Needless to say, it is nearly impossible to find such cemeteries when the corn is taller than you are! The well-dressed cemetery researcher wears long pants, a long-sleeved shirt, sturdy shoes and gloves to help ward off critters such as snakes, gnats, ticks and mosquitoes. If the cemetery is in a wooded or rural location you may also want to bring along a hoe to help cut down brush and a friend or fellow researcher for safety. Even if it is broiling hot when you visit the cemetery, the long pants and sturdy, comfortable shoes are a good idea. Whether the cemetery is public or private, you should do a search for existing records. Most commonly known as sexton's records (a sexton is a caretaker responsible for the cemetery), these records can include burial registers, plat maps and plot records. These records will vary greatly by country and time period and may not exist, but never assume! A sign outside of the cemetery may be able to point you to its caretaker. Turn to the local phone book to contact area funeral directors or churches. Check with the area library or historical/genealogical society for tips on possible record locations. You may be surprised by what you can find. One last thing - before you visit a private cemetery, be sure to get permission from the land owner! Consider bringing optional items such as a digital camera, video camera, tape recorder or handheld computer. Extra batteries for anything that may need them! The highlight of any trip to the cemetery is reading the stones. Once you have taken that irresistible quick peek for your ancestor's headstone, however, you should stop and plan out your route around the cemetery. Methodical might be boring, but it greatly decreases your chances of missing something important when you're searching a cemetery for clues. If the cemetery is not too large, and you have enough time, it can be very helpful to make a complete transcription of the cemetery. Even if you only make note of the names and dates on each tombstone, along with their location in the cemetery, this can save you a trip back in the future as well as help other researchers. There is a lot of information and advice available on the proper methods for transcribing tombstones. While these can serve as great reference guides, there is really no need to worry about formality. The important thing is to make a note of everything that you see. Write down names, dates and inscriptions exactly as they appear on the stone. It is very easy to make assumptions in the excitement of the moment, and it will be very beneficial to have an accurate record as you move forward (or backward as the case may be) with your research. Be sure to sketch any symbols that you are unfamiliar with so that you can look them up later. These symbols or emblems may be valuable clues to membership in an organization which may have records about your ancestor. Make a note of the physical relationship between tombstones as well. Family members will often be buried together in the same plot. Nearby graves may belong to parents. Small unmarked stones may indicate children that died in their infancy. Neighbors and relatives may also be buried in adjoining sections. As you make your way around, be sure not to miss the back of the stones as they can also contain important information. Another good way to record cemetery information is to use a cassette recorder or video camera as you move around the cemetery. You can read off names, dates and inscriptions easily and make note of important information, such as when you start a new row. It also provides you with a backup for any written transcriptions that you have made. Pictures are worth a thousand words and are much better for tombstones than chalk or shaving cream. Use hand-held clippers to clear brush away from the stone and then use a nylon (never wire) bristle brush and plain water to clean the stone from bottom to top, rinsing well as you go. A bright sunny day and a mirror to help reflect the sunlight on the stone can really help to bring out the carvings. Most important for your cemetery visit is to enjoy yourself! Visiting cemeteries is one of the most rewarding parts of genealogy research, so stop and take the time to commune with your ancestors.